274 N. Goodman St. (in Village Gate)473-0050, espadasteak.comWednesday-Thursday 4:30-10 p.m.; Friday-Saturday 11:30 a.m.-3 p.m. (lunch) & 4:30-11 p.m. (dinner); Sunday 10 a.m.-3 p.m. (brunch) & 4:30-9 p.m. If you do a Google image search for "rodízio," a Brazilian-style restaurant in which servers continually bring diners food until the patron signals they've had enough to eat, one of the first images you'll see is a man sitting in a restaurant. Before him is a table cluttered with dishes, food scraps and used utensils. His shirt is lifted to reveal his naked torso, hands resting on his clearly engorged, pregnant-with-a-food-baby belly. The man smiles dazedly at the camera, eyes slightly glazed: the symptoms of what I like to think of as a meat hangover. I recognize his expression. It's the same one I had on my face after dining at Espada, Rochester's only churrascaria, a.k.a., Brazilian steakhouse. (I refrained from hiking up my shirt.) It's hard to leave Espada without feeling very full. I'm talking an after-Thanksgiving-dinner kind of full. 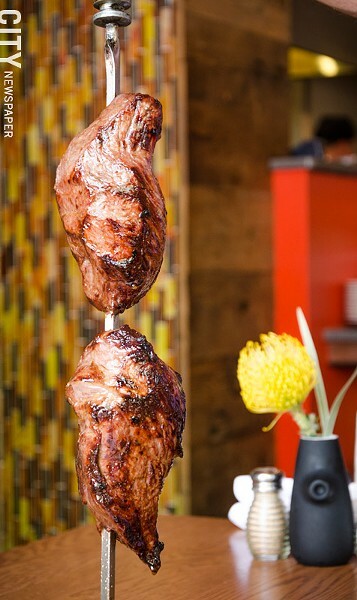 Espada fills Rochester's churrascaria niche and will appeal to serious carnivores. I'm not one of them. On my initial visit, I made the mistake of not flipping my chip to red the moment I received a portion of food -- more on that in a second -- and ended up like Lucy Ricardo in the chocolate factory, gobbling up morsels as quickly as I could to keep things from piling up. There is so much food, copious amounts of meat and sides and salads, that it's easy to become overwhelmed, even numb. It's a shame if that happens, as there are some things that Espada does well. At dinner, you're offered three all-you-can-eat rodízio "levels" from which to choose: green, silver, and gold. The green rodízio ($20) gives you access to the salad bar -- a misnomer, because in addition to green salads, you can easily make a meal of rice and beans, soup, canapes, grilled vegetables, and other assorted sides. The silver rodízio ($35) gets you the salad bar, plus eight types of meat, including chicken drumsticks, parmesan-encrusted pork, and two types of sirloin. The gold rodízio ($45) -- a churrascaria for Henry VIII -- affords you the salad bar, all the silver-level meats, plus five additional meats (filet mignon, filet wrapped in bacon, lamb chops, beef ribs and rib eye). There is also a children's rodízio option ($15). All levels come with Brazilian cheese bread (akin to a chewy French gougère), mashed potatoes, and fried plantains. Silver and gold rodízio diners are handed a cardboard chip. One side is ringed with your selected color to signal for food, and the other side is red to ask for a respite. When your chip is flipped to silver or gold, large hunks of beef, pork, lamb, and chicken are presented to you on a steel skewer and sliced onto your plate with machete-like knives; in some cases, you catch the slice with a pair of delicate tongs. 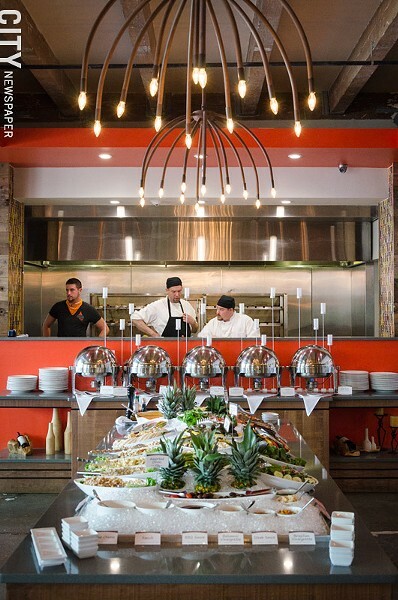 Only moments earlier, those skewers had been in the kitchen, spit roasting over hot, charcoal-fueled flames, the chef keeping a watchful eye on the meat, and occasionally, the curious diners looking in at him through the large plate glass window overlooking the salad bar. At the salad bar, heap onto your plate some feijoada, the zesty and flavorful Brazilian take on rice and beans made with pork. Top this off with farofa, a well-seasoned bread-crumb topping, to add another layer of flavor and a bit of crunch. Scatter more farofa on your plate to soak up the meat juices that are soon to come. The tri-tip steak is packed with richness, strong in umami, and a bit chewy (not unusual for this cut). Out of all the proffered beef, this one was the most "meaty" and the most satisfying. Two cuts popular in Brazil and, therefore, Brazilian steakhouses, are the picanha and alcatra, cuts of top sirloin. Both slices I received had an off-flavor, yet the hearty pieces a friend received were fine. The meal is finished off with grilled pineapple, slathered in cinnamon sugar. Tropical, light and satisfyingly sweet, it's a refreshing contrast to a salty, protein-packed dinner. Those not in the mood for a heavy meal don't need to avoid Espada. 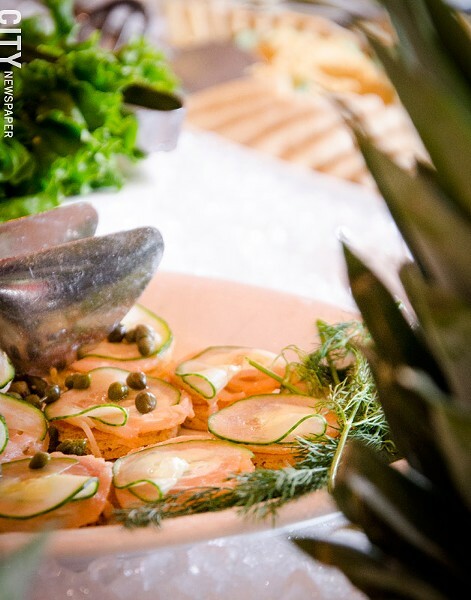 Sunday brunch offers a lighter take on the silver rodízio, plus several traditional breakfast options. One Sunday, I enjoyed an unexpected chilled strawberry soup from the salad bar, a sweet and fresh taste of summer in a bowl. Vegetarians, too, will have plenty of choices at the salad bar, though they may be put off by its close proximity to the grilling meats. Or, you might spend a languorous evening at the bar, enjoying a wickedly delicious strawberry mango caipirinha ($8). Traditionally made with sugar, lime, and cachaca, a liquor derived from sugar-cane juice with a flavor somewhere between light rum and silver tequila, a strawberry mango caipirinha is not the standard -- but is too good to pass up. Order an à la carte item or two from the bar menu to offset the effects of the potent cachaca. The bar itself is a 30-foot structure of well-polished, reclaimed wood, and is a great vantage point from which to admire the dining room. It's a beautiful mix of natural and industrial touches: high ceilings with exposed wood and ductwork, Edison bulbs shining down on chairs built from an old ship, restored glass tiles shimmering behind verdant plants. The overall effect is hip yet relaxed and inviting, and well-suited to an after-work drink, light brunch, or a dinner consisting of a mountain of meat.